A Little Wild says Sorry! Welcome to my blog today. 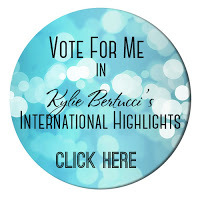 It’s time to participate in Kylie Bertucci’s International Blog Highlight for October. 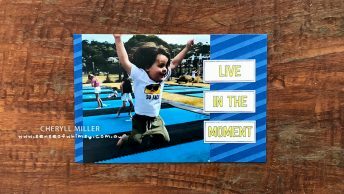 Kylie sets a theme each month and highlights Stampin’ Up! demonstrator’s blogs from around the world. The theme this month is Sorry. 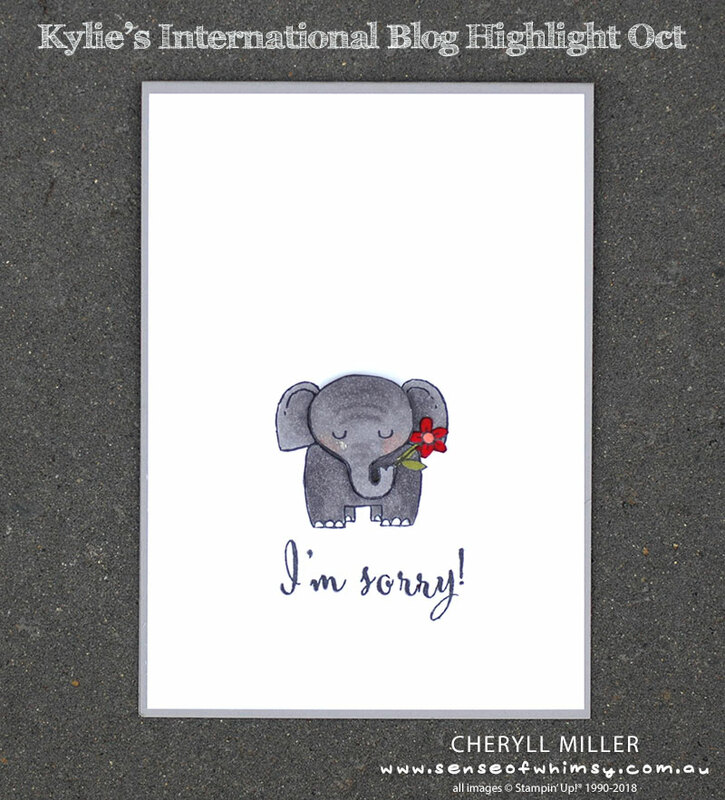 There is more information on this monthly challenge on Kylie’s blog if you are a demonstrator and feel like this is something you would like to participate in. This is also where the gallery of projects is today. 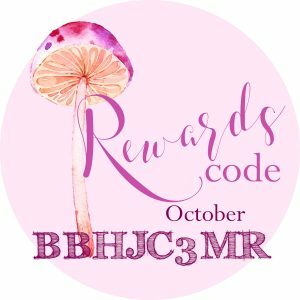 And we are looking for your votes to decide who goes through to participate in a blog hop with Kylie late in the month. Voting will stay open for a week. 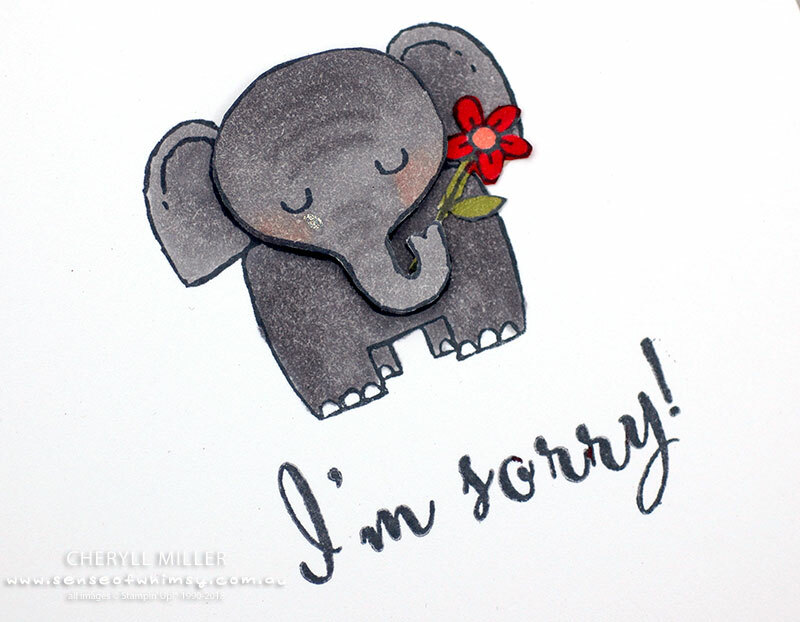 The “sorry” theme can be interpreted in different ways, Sorry for your loss, Sorry to hear of your bad news, but sometimes, it is very appropriate to say “I’m sorry … for that thing I did”, or “I’m sorry … that i upset you”. 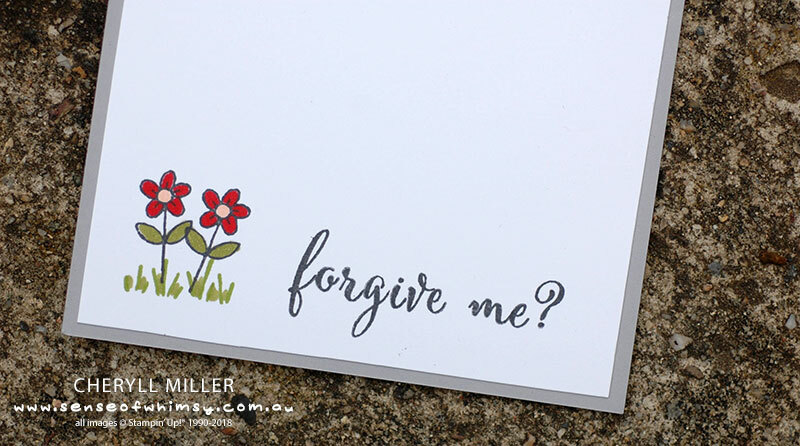 We all do things sometimes without thinking, and it can be difficult to pick up the phone and say “I’m sorry!” … so here is the perfect solution … send a card. 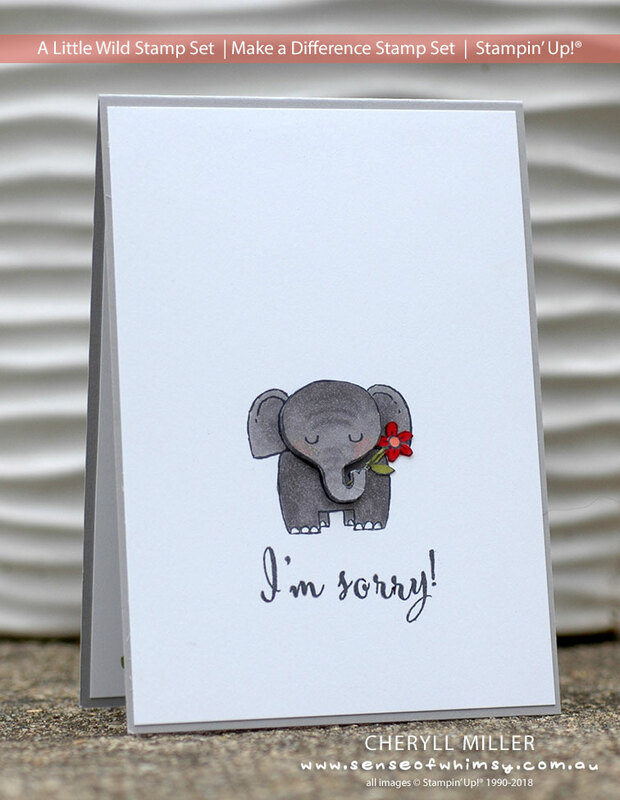 This adorable little elephant is looking truly sorry! A furrowed brow, downcast eyes and a single tear. Can you see that tear? Here is a closer look. The letters are from the Make A Difference stamp set. I was able to make my own greeting even though I didn’t have a stamp that says “I’m Sorry”. The elephant is coloured with Stampin’ Blends, so he has been stamped with Black Memento. I used Dark and Light Smoky Slate with just a little touch of Light Flirty Flamingo in his cheeks. Thank You For Voting last month! A very big thank you to all who voted for me in last month in the blog Highlight. 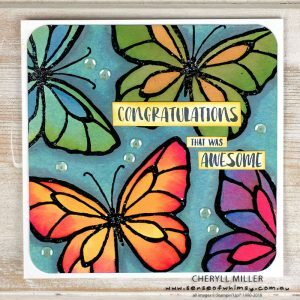 I was fortunate enough to be in the top 10 with my colourful butterfly card. I truly appreciate you going in and casting your votes. I am in spot 16. If you would pop on over to the gallery and vote for me, that would be fantastic. I have had a peek at the gallery and there are so many different ways to express sorrow, so please vote for your five favourite projects here. If you are in Australia and would like to purchase any of the products used to create this project, click on the thumbnails to go directly to that product in my online store. Don’t forget to use the monthly rewards code to get an extra little thank you from me at the end of the month. And notice that I have just assumed it would be Duncan giving me the card (and not vice versa) … hahaha!